EcoFinish® is the newest and most effective pool resurfacing technology on the market, and Ecoboys is proud to bring this game-changing product to residential and commercial pools within British Columbia. EcoFinish® transforms your old, worn fiberglass and concrete pool surfaces to like new condition that is long-lasting. This designer finish is available in a wide range of colours, making it highly versatile. Its scientifically-formulated aquatic coating provides a chip, peel, crack, and stain resistant seal that traditional gel-coat and paint finishes can’t deliver. Essentially, it’s the wave of the future. And an added bonus — it’s quick and easy to install. EcoFinish products can be applied to concrete, fiberglass, steel, and aluminum. 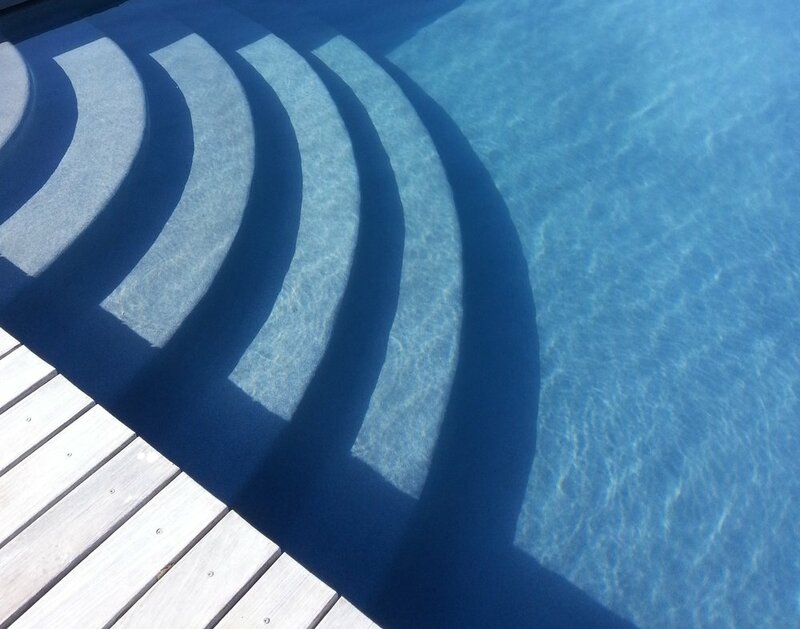 For example, in one easy step, our product can perfectly cover a concrete pool that has fiberglass steps, resulting in a seamless finish. Our specially-designed application system allows us to install coatings at a faster pace than other methods. Our crew can easily install a high output rate of 700 square feet per hour coat. A standard size pool can be coated within a day. aquaBRIGHT’s large color palette to choose from is UV fade-resistant, so it will not “mottle” or fade over time. It is also stain, crack, and peel resistant, so it will last years to come with zero maintenance. aquaBRIGHT is environmentally friendly because there is little to no waste during installation and less of an environmental impact. Mining, transportation, and other wastes associated with plaster and paint finishes are now a thing of the past. Check out this short video demonstrating the process of applying aquaBRIGHT to this standard size concrete swimming pool.